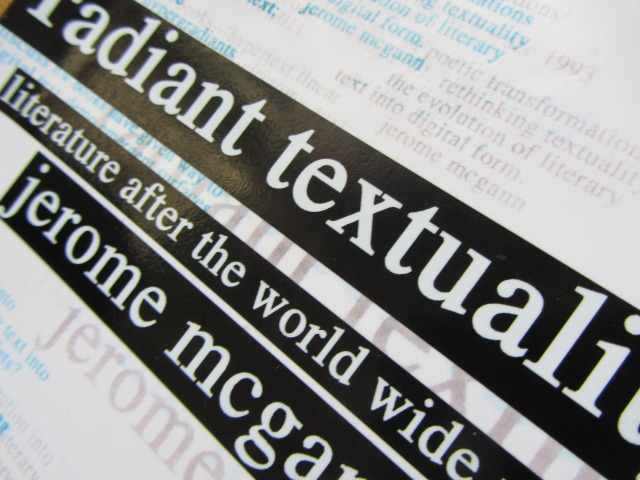 I am going to write a longer commentary on Jerome McGann’s Radiant Textuality: Literature After the World Wide Web (Palgrave, 2001) in an upcoming post, but a few sections of his preface and introduction (“Beginning Again: Humanities and Digital Culture, 1993-2000) are striking for how relevant they remain over ten years after he wrote the book. The first is that understanding the structure of digital space requires a disciplined aesthetic intelligence. Because our most developed models for that kind of intelligence are textual models, we would be foolish indeed not to study those models in the closest possible ways. Our minds think in textual codes. Because the most advanced forms of textual codings are what we call ‘poetical,’ the study and application of digital codings summons us to new investigations into our textual inheritance (xi). Digital technology used by humanities scholars has focused almost exclusively on methods of sorting, accessing, and disseminating large bodies of materials, and on certain specialized problems in computational stylistics and linguistics. In this respect the work rarely engages those questions about interpretation and self-aware reflection that are the central concerns for most humanities scholars and educators. Digital technology has remained instrumental in serving the technical and precritical occupations of librarians and archivists and editors. But the general field of humanities education and scholarship will not take the use of digital technology seriously until one demonstrates how its tools improve the ways we explore and explain aesthetic works—until, that is, they expand our interpretational procedures [italics in original] (xi-xii). We have to break away from questions like ‘will the computer replace the book?’ So much more interesting are the intellectual opportunities that open at a revelatory historical moment such as we are passing through. These opportunities come with special privileges for certain key disciplines—now, for engineering, for the sciences, for certain areas of philosophy (studies in logic), and the social sciences (cognitive modeling). But unapparent as it may at first seem, scholarship devoted to aesthetic materials has never been more needed than at this historical moment (xii). Computational systems…are designed to negotiate disambiguated, fully commensurable signifying structures. ‘Indeed! But why not also ask: How shall these machines be made to operate in a world that functions through such ambiguities and incommensurable?’ (xiv). In our day the authority of this Nietzschean break has greatly diminished. Modern computational tools are extremely apt to execute one of the two permanent functions of scholarly criticism—the editorial and the archival function, the remembrance of things past. So great is their aptitude in this foundational area that we stand on the edge of a period that will see the complete editorial transformation of our inherited cultural archive. That event is neither a possibility nor a likelihood; it is a certainty. As it emerges around us, it exposes our need for critical tools of the same material and formal order that can execute our other permanent scholarly function: to imagine what we don’t know in a disciplined and deliberated fashion. How can digital tools be made into prothetic extensions of that demand for critical reflection? (18). I’m in the middle of this book as well. We obviously have some sort of psychic book club thing happening. One thing I desperately want to do with this book, as relevant as it still is, is create an annotated edition of it with updates to new, relevant tools, schemas, etc. for some of the things he is talking about being unable to do. Suppose I could (and should) easily turn that into a blog post.